Is Germany a country of classical music? For 88% of Germans believing that classical music is part of the country's cultural heritage, it’s a big yes. And in the context of Germany’s federal elections, let’s take a look at the music education system on the other side of the border. A large majority of Germans (88%) believe that classical music is part of the country's cultural heritage, according to an article of the Deutsche Welle published in 2014. About 10% of the German population have an amateur practice of music, one third sings, while a quarter are part of an instrumental ensemble. Public music schools count a million students and almost the same number of students attend music lessons as part of their cursus. Approximately 90,000 students participate in music-related educational programs. It is difficult to get an overview of music education in a country divided in16 federal states, each of them having total autonomy in the way they carry out culture and education policies. Michael Hampel, professor and guitar teacher at Trossingen University of Applied Sciences explains: ‘’We should de facto speak of 16 autonomous education systems, with varying degrees of commonality within the framework of federal educational and cultural policy. Their coordination is provided by the Federal Commission for Culture and the Media (Bundesbeauftragter für Kultur und Medien, or BKM) and the Ministry of Education and Research. As a result, the situation of music education, both in public and music schools, varies considerably from one Länder to another." 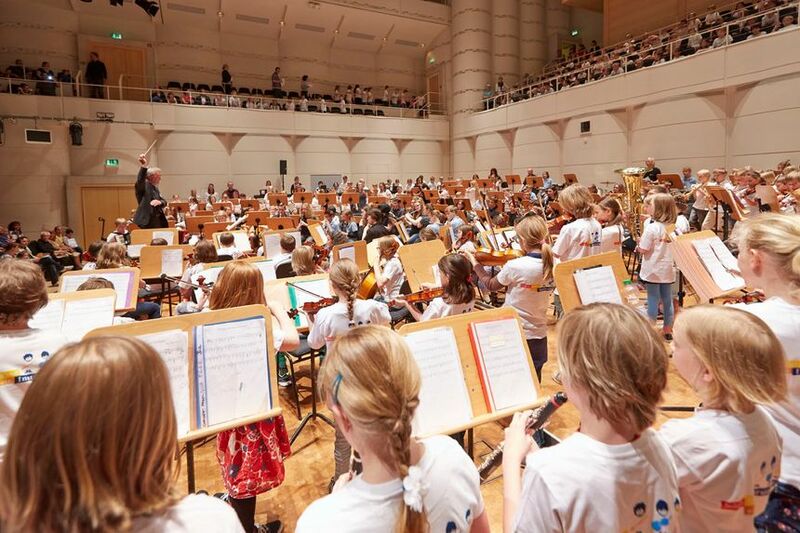 However, what is widely shared in German society is a consensus on the importance of arts education, and therefore music education, financed by taxpayers’ money, says Michael Hampel. Germany has a rich network of music schools supported by local authorities and municipalities. According to the German Music Information Centre's report on musical life in Germany, about 900 music schools are affiliated with the German Association of Public Music Schools and provide music education in 4,000 locations throughout Germany, including rural areas. In addition, German students receive music education as part of their curriculum throughout their studies in all kinds of federal schools. We also learn that music education courses in schools are taught once or twice a week, depending on the state, and that music education is also part of the cross-disciplinary curriculum, combined with other subjects. From first to ninth grade (that is to say from 6 to 15 years old), music education is compulsory and regular, only becoming optional in grades 9 and 10, during which it can be replaced by art history. “The teaching is quite theoretical: musical writing, harmony, organology, history of music, works analysis", explains Anja Louka, a German music teacher based in France where she teaches music in secondary school. “German students acquire a solid background in musical knowledge. They are prepared to analyse pieces such as Bach’s choir for instance" she says. There is no introduction to the instrument in compulsory education, but institutions encourage musical practices outside of school time. “What makes German system’s strength is the complementarity between school music education and the importance attached to amateur musical practices: music is a noble and recognized discipline, and schools’ musical life outside school hours is of great importance. Students have school in the morning, and they have plenty of time to devote to leisure activities in the afternoon during which music plays a key role. In almost all schools, there is an orchestra made up of students trained in music schools. Non-musician students sing in the school choir. Singing in a choir, being part of an orchestra or attending a music school is rather well regarded. The most “popular” students are precisely the musicians. Summer camps dedicated to singing and music are organised, and this effervescence gives rise to many vocations.” This is Anja’s case, coming from a family of non-musicians, amateur music practice after school hours was a trigger to become a music professor. Despite a strong support for music education at the federal level, the situation is less rosy on the ground. Economic and financial crisis, demographic changes, reforms of the school system, it has been observed in recent years that access to music education is not equal for all children and young people and that disparities are great from one state to another. One of the reasons for this situation is the shortage of specialized music teachers in schools. Added to this are the recent reforms of school rhythms, which have reduced the duration of compulsory schooling by one year in some states, and which have lengthened the day of young Germans. "Students are overloaded, the pressure for results is greater and priorities change. Instead of music or sports, parents encourage children to learn English or Chinese for them to become more competitive on the labour market. The time that was once devoted to instrumental practice is becoming increasingly taken away, and music tends to become less important in the school curriculum", says Michael Hampel. In some music schools, demand far exceeds the number of places available. Since the reunification, access to music education institutions outside the public school system has been steadily declining.There are nearly 100,000 children waiting for a place in a public music school because budget cuts prevent schools from hiring enough teachers. "Unfortunately, in Germany, funding for music schools is not regulated by law, as it is the case in Austria and Switzerland, explains Michael Hampel. Public music schools are 90% funded by cities and communities, but their funding falls into the category of cultural or sports facilities, which are therefore optional. When it comes to saving money, they are the first to be affected, because we have to make choices. In recent years, budget cuts have jeopardized the future of many music schools. Since the payroll represents the budget’s largest expenditure, it is especially the teachers’ working conditions that are suffering the most.” This is a further disincentive to young candidates for their professionalization in music education. How to contain the decline of music education for it to breathe new life? By musical practice as a vehicle for bringing public schools and music schools together, precisely. With projects such as JeKI - Jedem Kind ein Instrument (an instrument for each kid), launched in Bodrum in 2003. The aim is to give access to artistic education to all children from a very early age, especially those coming from immigration or underprivileged backgrounds of Ruhr region, which has been severely hit by economic conversion. But these types of project also mean to enhance the country’s immense musical heritage. This mechanism allows each child to learn how to play an instrument as part of the compulsory teaching of music at school. Music schools’ teachers give instrument lessons to all students as part of a biennal system, entirely supported by the municipality. This policy is a great success. Indeed from 2007, the authorities of North Rhine-Westphalia take over this project and develop it over other territories. In early 2010 - when Ruhr region became European Capital of Culture - music education is the spearhead for artistic education’s democratisation. Over time, the initial project is expanded and reshuffled: JeKiSti now offers not only instrumental practice on both classical and other cultures’ instruments but also dance and singing. Music institutions’ professors work with school teachers to receive specific training for collective teaching and, in turn, train them on different aspects of music teaching. Students have two practice classes per week and learn about instruments, body expression, musical writing and theory, as well as ensemble performance as part of a two-year program. The first year is completely free of charge, and for the second year, families only pay from 12 to 23 euros per month, with regressive rates calculated according to the family’s income. Interest in JeKiSti has been continuously increasing. For the year 2016/17, 150 municipalities took part in the project, conducted in 814 schools with 126 music or dance schools. The North Rhine-Westphalia region is now investing more than ten million euros annually and the project has spread to other Länder throughout the country. Since 2009, the federal government has started funding extensive studies on Jeki and JeKisti’s content, evaluation and foresight. "Since the introduction of JeKiSti, music education’s landscape has profoundly changed", says Birgit Weller, JeKisti project coordinator. "Previously, only 5% of children in school attended music lessons in music schools. Today, 20 to 30% of children play an instrument. Teachers are supported and trained in arts education, and music schools are given greater visibility, especially among children who do not naturally evolve in culturally privileged environments. The rate of children who continue music after school or elsewhere has skyrocketed to around 20%. In the end, it’s a win-win situation for everyone involved’’ , she says.